That’s a comment I heard recently when taking an experienced rider out for an Enhanced Rider Scheme assessment, and it got me thinking. So many riders learnt to ride before the introduction of the current 2-part practical test with the separate module-1 and its focus on slow-speed riding control, that many have never been taught how to use the back brake effectively. As someone who spends most of his time watching other riders, I can’t help but notice the number of riders who, when trying to ride slowly, dangle both legs, almost dragging their feet on the floor. Invariably they wobble about and then when they do come to a stop almost lose their balance as they over-use the front brake and suffer “fork bounce”. So perhaps it’s time to look at that mysterious lever under where we rest our right foot in more detail and explore what it is for. But before we do, let’s get one thing really clear. The front brake is the one we need to use when trying to shed a lot of speed quickly. The energy from forward motion, combined with deceleration as the bike slows down about the tyre contact patches, will compress the front forks pushing the front tyre into the ground and increasing its grip. That means we can use the more powerful front brakes to slow the bike down – by squeezing the front brake lever harder as they front tyre is pushed into the road. Using the back brake under these circumstances is likely to result in a rear-wheel lock-up and consequential skid, as the rear suspension is unloaded and the rear becomes lighter (so has less grip). But here we are not talking about going quickly, we are discussing riding slowly – down towards a walking pace. Under these circumstances the front brake is too powerful and the compression of the forks and subsequent “bounce back” will only unsettle the bike and cause us to lose balance. It’s here the back brake becomes really useful. Most riders know that to ride slowly they keep the throttle open slightly whilst slipping or feathering the clutch to reduce the drive to the back wheel – using the clutch as a “dimmer switch” if you like. But this only reduces drive, it doesn’t slow the bike down, and furthermore, it relies on the rider’s balance to keep the bike upright as the speed drops and the gyroscopic effect of the rotating wheels reduces. This is why many dangle their feet as they are worried about dropping the bike. 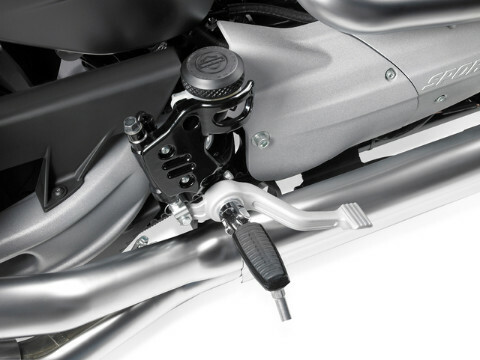 By gently dragging the back brake, though, the bike can be slowed against the forward drive – holding it back – and this will increase the bike’s stability significantly. It will, in effect, “stand up” and become less likely to wobble or fall over. This in turn will increase the rider’s confidence as he/she is no longer trying to balance the bike – it’s balancing itself! Using the back brake in this way – to slow the bike down when riding slowly – increases the bike’s stability and that in turn enables the rider to turn the bike in a smaller space. A gentle application of the back brake during a U-turn, or when negotiating a tight turn such as a mini-roundabout or hairpin bend, will help the bike turn. So don’t neglect that back brake lever – at slow speeds, the back brake is your best friend as applying it correctly can get you out of difficulty. To try this for yourself, find a quiet road or car park and practice riding slowly in a straight line using just the clutch and then when using the back brake as well. Aim for about 3-4mph and see which method works best. Soon you’ll be singing the praises of the back brake.